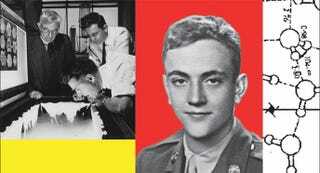 When Kurt Vonnegut was working as a PR flak at General Electric, his older brother Bernard was a famous scientist. And Kurt was there when Bernard demonstrated his incredible new invention: a way to seed clouds with dry ice and silver iodide and make it rain. Could this be used as a weapon? But this dramatic demonstration had a powerful effect on Kurt Vonnegut, as author Ginger Strand explains to the Geek’s Guide to the Galaxy podcast. Vonnegut believed he was seeing a science-fictional scenario coming to life—weather manipulation, along with weather-based weapons! Strand has written a new book about this time in the author’s life, called The Brothers Vonnegut: Science and Fiction in the House of Magic.